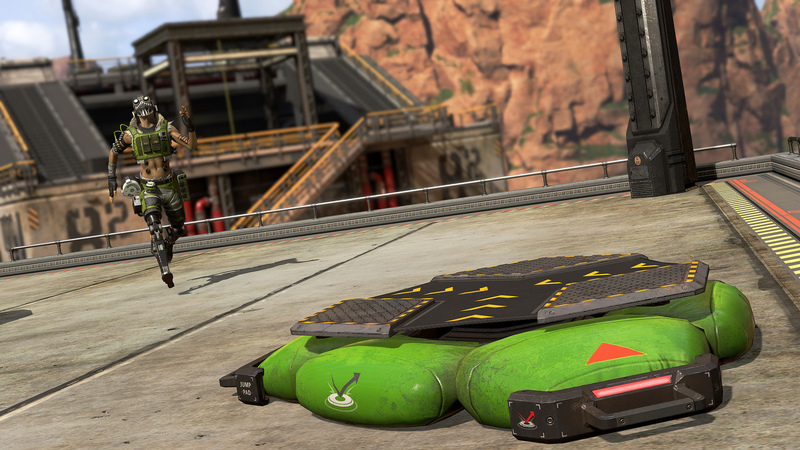 Like other battle royales before it, Apex Legends will be featuring big content packs dropped at regular intervals throughout the year. These often become jumping on points for people looking to start playing, or new goal posts for regular vets. These also normally mark the point where you should start grinding to get new loot, and Apex Legends is no different. Their first season, called Wild Frontier, promises to provide tons of stuff to earn and buy. Anyone who plays Apex Legends during Season One will have the opportunity to earn a Wild Frontier Legend Skin, 5 Apex Packs, and Wild Frontier themed stat trackers. There's nothing specific about what legend you'd get the skin for, of if it's a choice. Apex Packs - essentially loot boxes - are always a welcome addition. Fancy stat trackers will have you looking like you know what you're doing out there, even if the stats themselves could use some work. Yes. Everything mentioned above can be obtained for free. It's just a fraction of what can be earned when you buy the Battle Pass, though. 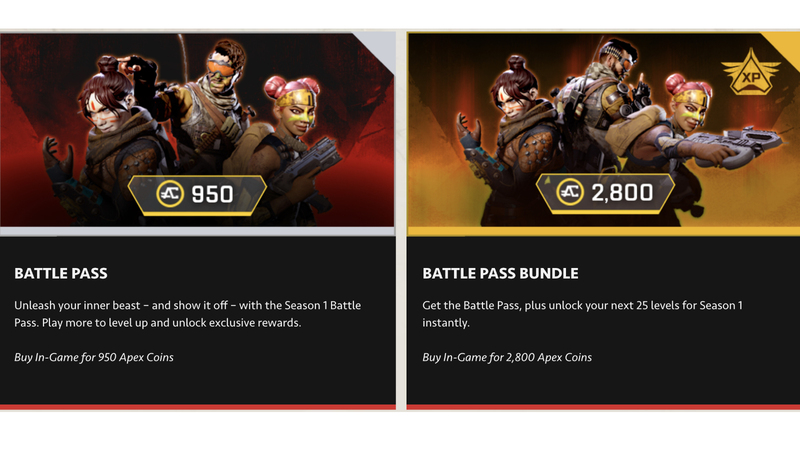 The Apex Legends Battle Pass is basically a subscription to all the goodies that Season One will have to offer. Every level you gain will unlock some sort of reward, like weapon skins or XP Boosts. Over the course of the season, there will be over 100 different things to earn. And as soon as you buy it, three Wild Frontier skins (for Lifeline, Mirage, and Wraith) will unlock for you. Such a smorgasbord of stuff for 950 Apex Coins, or $10. Apex Coins? Can't I earn them in-game? You can! Meaning you don't actually have to pay any real world money for it if you've been stacking your chips. If you can spare 2800 Apex Coins ($30), you can actually skip the first 25 levels, and get all of their bonuses right up front. Glancing down the Battle Pass track, it looks like you'll get an opportunity to earn just enough Apex Coins to pay for the next seasons Battle Pass, too! What if I buy it after I've already started playing? 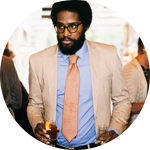 Then you will gain all of the level-appropriate awards retroactively. You can't get the battle pass now but might be on board mid-season, then you're free to jump on board just like you were already there. When does Season One end? There's been no mention of when the season is supposed to end. But keep in mind, any season-specific gear you haven't earned by the end cannot be earned anymore. Earned content stays with you forever, but unearned Wild Frontier stuff lives and dies in this season. What else does the season bring? The last big piece of content is the opportunity to unlock a brand new legend: the oft-leaked and rumored Octane! Besides run so fast that he broke his own legs off(! ), "The High-Speed Demon's" main ability lives up to that moniker, giving himself a big speed buff while making him immune to slows for a period of time at the cost of some of his health. When out of combat, he gradually heals himself. How’s that for synergy? As an Ultimate, he creates a personal launch pad for his team that bounces the squad high into the air. I'm sure the tactical applications will be phenomenal. Does he come in the Battle Pass? All signs point to no. He will most-likely be an unlockable legend along the lines of Caustic and Mirage. Right! 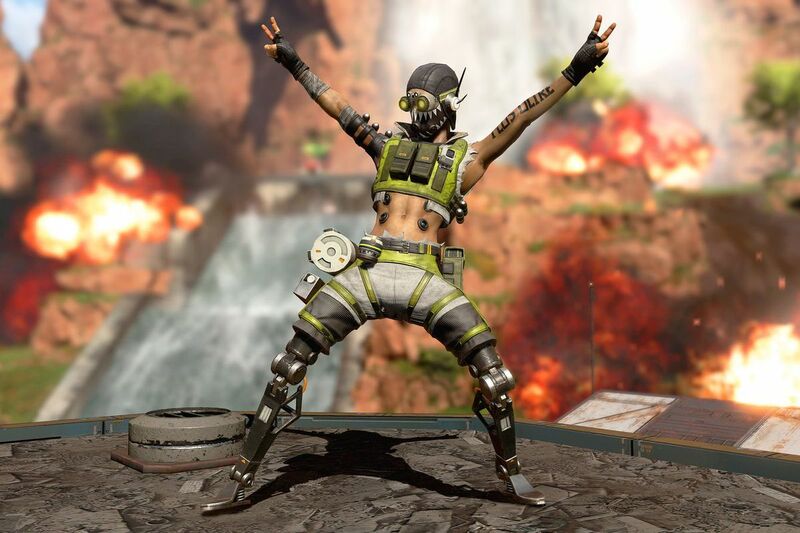 Apex Legends has had a big couple of months, and it looks like that's not changing at all. If I needed tips and info about the game, and wanted to stay up to date with the pro-scene, where would I go? Good question. 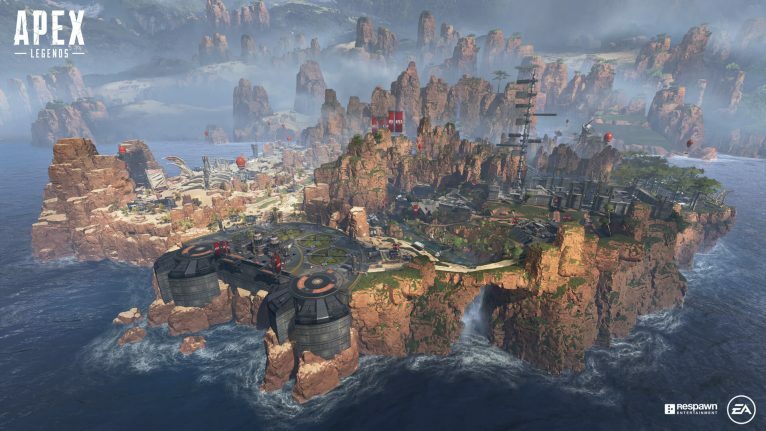 First, come to our Apex Legends wiki for all of your nitty gritty questions. If you want to stay up to date with pro scores and standings, like this week's ESL Open Cup, come on over to our Apex Legends eSports Wiki. Amazing Game. Thanks for providing detailed information.